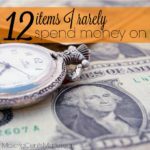 If you’ve been researching how to save money, you’ve likely come across the term “no spend month”. 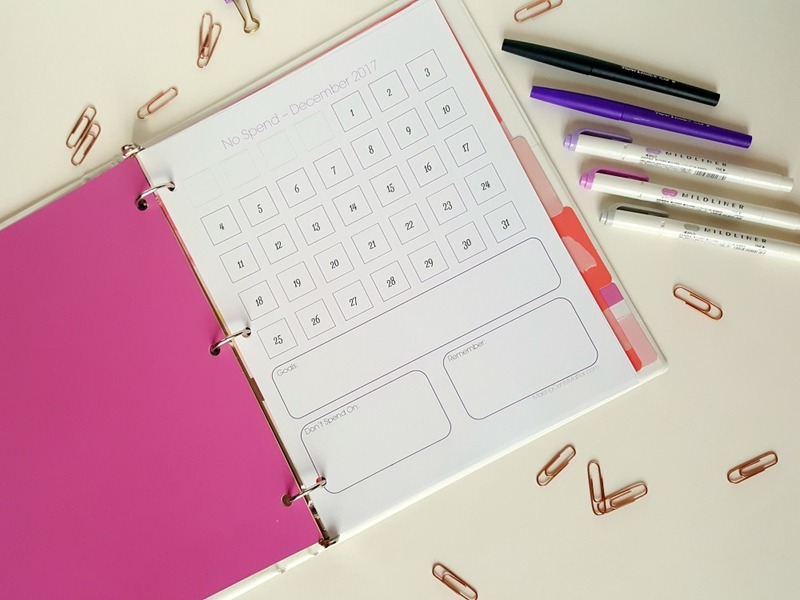 No spend months are a great way to save money, but in order to save money, you have to know what a no spend month is, and what your boundaries are during your no spend months. Some people think that a no spend month means you spend no money at all. 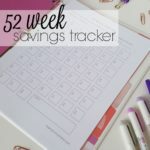 While I would LOVE it if I could spend absolutely no money through the course of a month, and just tuck it all our income into savings, the reality is that I still have bills that need paid, and savings I still need to keep up with. So at the very least I’m doing some form of spending. Simply put, a no spend month is where you reduce your spending in certain categories, and stop impulse purchases throughout the month. You become aware of, and stop, your unnecessary spending. When you’re getting started on your journey to financial freedom, no spend months are more about becoming aware of how much you spend, and how often you make impulse purchases. Speaking from experience, it’s astonishing how much money gets spent on unnecessary items. 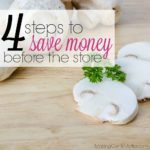 Some people who are further along in their financial journey, who no longer impulse spend, often see a no spend month as an opportunity to shop from their pantries and freezers to make their meals. This doesn’t mean that they don’t spend money on groceries at all throughout the month, just that they are reducing the amount spent by first shopping from what’s on hand. What Are Your No Spend Month Goals? As I said earlier, a no spend month usually comes with the end result of reducing spending. Whether you’ve gotten into the habit of buying that coffee on your way to work, takeout for lunch, or a few extra items that weren’t on your list at the grocery store, a no spend month can help you reduce your expenses. But you have to know what your spending habits are in the first place. For me, at this current stage of my life, I’m staying at home. I don’t go out for coffee every morning, and I eat leftovers for lunch at home. 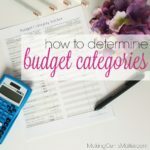 For me, my extra spending habits usually happen when I’m out for groceries, or the occasional additional item in my cart during purchasing necessary items on Amazon. I’m not perfect… I’m totally human and totally guilty of impulse purchases. But then there’s Target. Target is my weakness. I love Target like I love my kids. The cleanliness and organization of the store is so inviting, and I know that every time I go in there for either household items, or a prescription, I will get lost in the rest of the store, including the Dollar Spot. Next thing you know, I’ve started adding things to my cart that we don’t need, and it dips into the rest of our budget. No spend months make me aware of that extra spending, and help me to minimize those impulse purchases. But it’s not just Target. Sometimes I’ll see I have an extra $5 in my grocery envelope, and I’ll go treat myself to some chicken lomein… it’s something that Monkey can’t have, and I enjoy very much. And let’s face it, no matter how hard I try, making it at home is never the same. But during a no spend month, that’s $5 extra that I’m more mindful of how I’m spending it. Instead of getting lomein, I can save for the groceries for the following week. 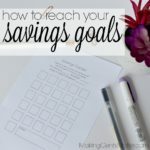 For goals throughout my no spend months, it depends on what I want to achieve. Am I looking to cut back on the lomein? Avoid Target at all costs? Or, in the case of my most recent no spend month, do I want to curb all impulse purchases because I have a huge medical bill I’m staring at? 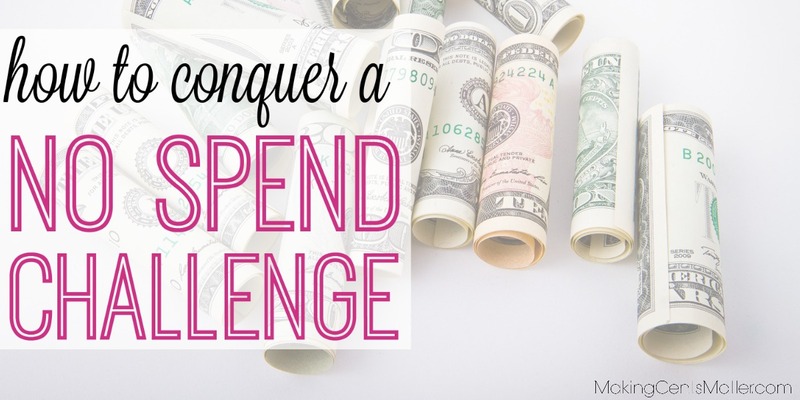 Knowing my goals for my no spend months help me remain accountable, and help achieve my goals. As I’ve already mentioned, just because you’re having a no spend month doesn’t mean you cut your expenses off entirely. If you have events that are already planned, like a business trip, a family get away, it doesn’t mean that you cannot spend money. Just don’t spend more than what you budgeted for the trip. And don’t spend money on impulse buys. For the case of our last no spend month, Thor Ragnarok came out in the same month. We’re die hard Marvel fans, and have made seeing the Marvel movies at their release our date nights. Since Marvel movie releases happen only a few times year, and I knew in advance we would be going to see it, I didn’t count it against our no spend month. We had a nice night out and stayed within budget. Win-win! I’m glad you asked! Like I said earlier, last month I needed to reduce my impulse purchases and save as much as I could. It was a month where we had an extra paycheck. Now usually I look at months with an extra paycheck as months that we can let the budget go a little loose. 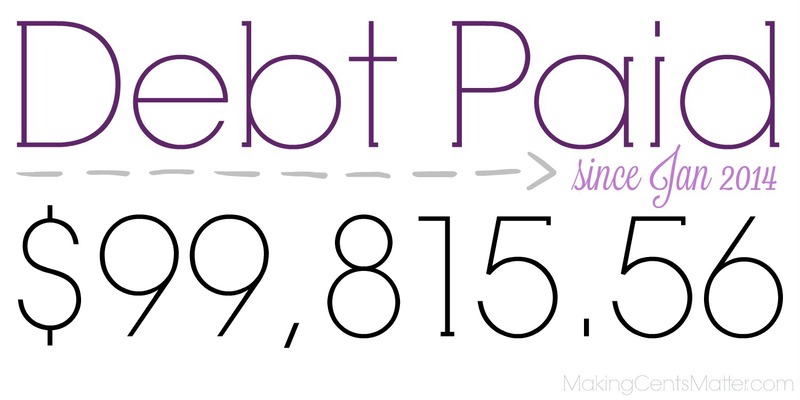 But I had $650 in medical bills I needed to pay, and I still wanted to pay off a decent chunk on my credit card. So I decided to have a no spend month. 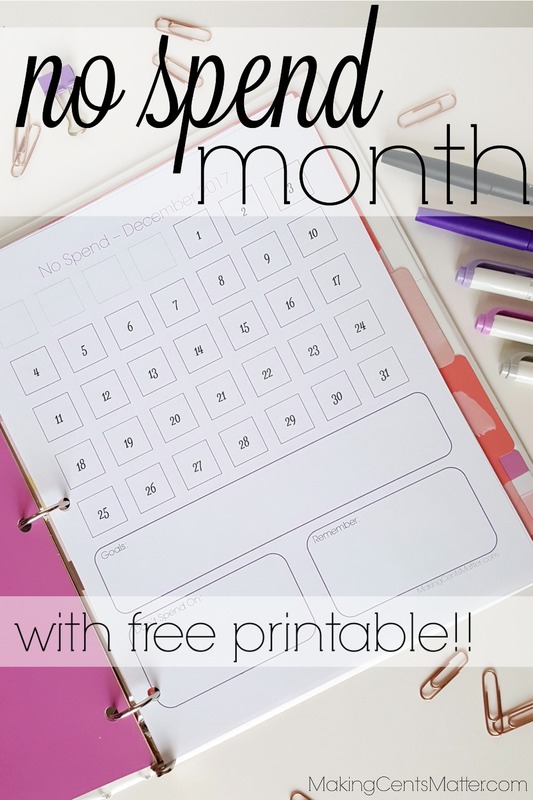 In order to keep track of my expenses and goals throughout the month, I created a printable. I knew my weaknesses were when I go to town, so structured my tracker like a calendar month. Were my spending habits or impulse buys worse on Thursdays and Fridays when I was in town? What about when we went out as a family on the weekends? Did I end up spending a little extra without realizing it when we had appointments? Or did I have a harder time saying no to the kids when they were off school and we were out and about? I printed it so two fit on one page, cut it out and stuck it in my bullet journal. This way I saw it every day, and it would help keep me on top of my goals. The best part? It really helped out! I colored the square purple if I succeeded and didn’t spend beyond what was planned for the day. If I made any impulse purchases, I colored the square in grey. Since I was working towards paying that medical bill, and honestly because soccer was over with, I didn’t spend beyond what was planned for the month. It was very satisfying to see all of the purple throughout the month. I loved it so much, I wanted to share it with you all! 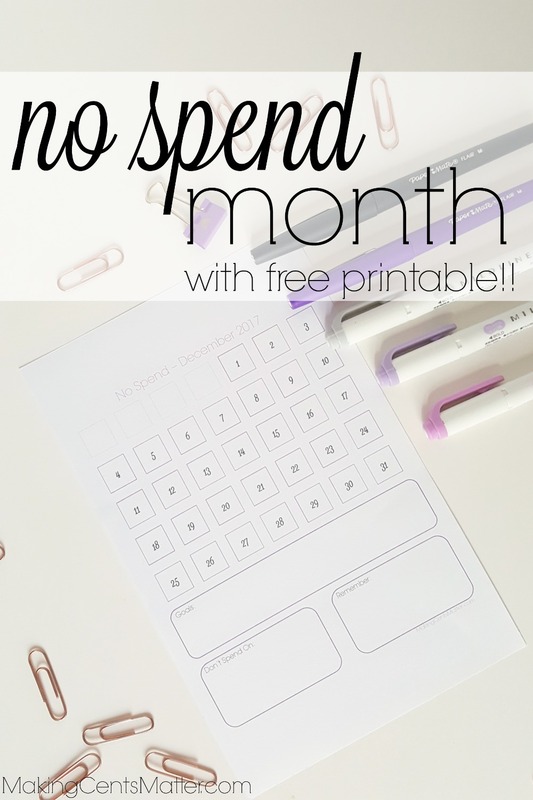 In my resource library there is currently a December 2017 No Spend printable available for you! I also created ones for each month after that, but they’ll be available as we get closer to those months. 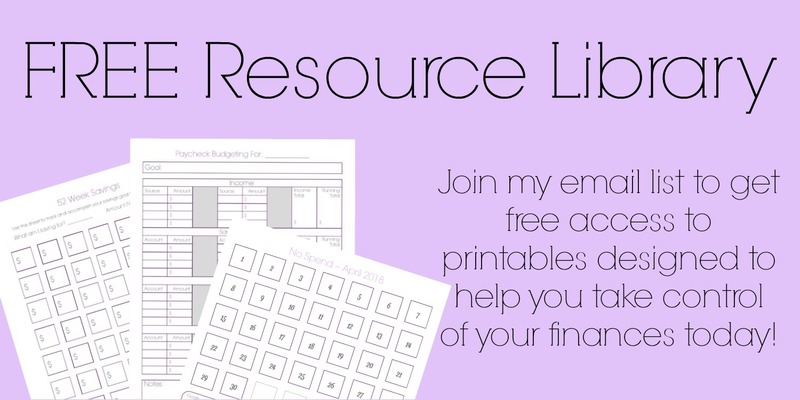 UPDATE: My resource library has an undated version, as well as dated versions for the current month! 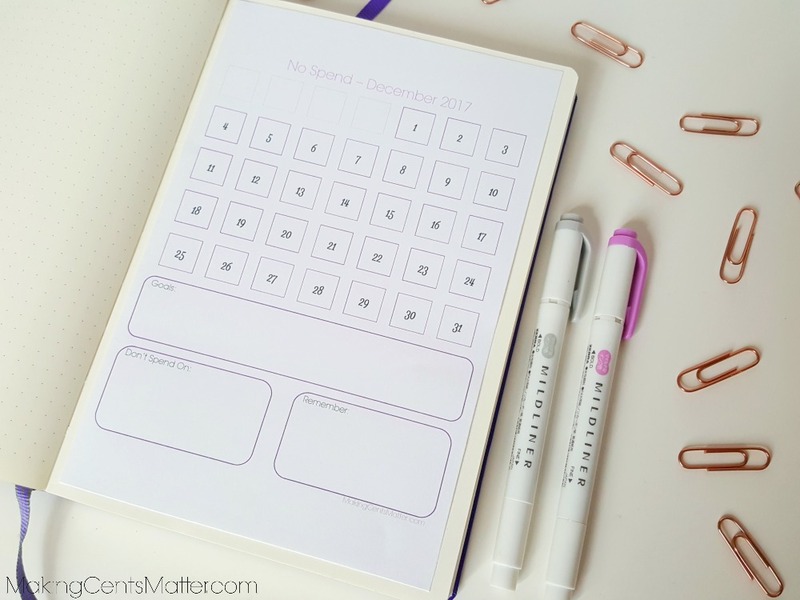 Aside from the calendar format, I also included space to write your goals, items to not spend money on, and what to remember throughout the month. There are also two different versions depending on your preferences; a Sunday start and a Monday start. I personally prefer the Monday start. It keeps my weekends together, that way I can analyze my spending habits and be more aware of them. 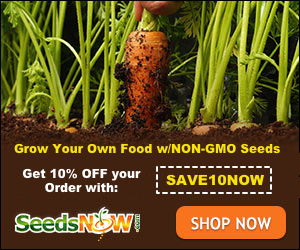 Have you thought about a no spend month? 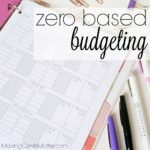 What are some goals you’d like to accomplish during a no spend month? Let me know below!